Sharon Gayter reaches the three-quarters mark of the gruelling Flora 1000 Miles Challenge at one o'clock tomorrow morning. It represents another psychological milestone as she battles to cope with sleep deprivation while completing one mile an hour, every hour, for six weeks. Sharon ran six of the miles yesterday and was intending to run more today. The event culminates when the five remaining competitors will run in the London Marathon on Sunday week. Stamina star Sharon Gayter has switched from walking to running as she approaches the 700 miles mark in the Flora 1000 Miles Challenge late tonight. Sharon said: "I'm running as many miles as possible now to tone up for the London Marathon, which follows the 1000 miles event. "But running the miles is quite hard as the traffic is very busy and the drivers do not give way to pedestrians." Sharon has been wearing a face mask to counteract her asthma and this has proved beneficial. The Guisborough ultra athlete is still going strong and is confident of completing the gruelling six weeks event, which reaches its conclusion at the end of next week. She said: "Every day is much the same. It was only the lack of traffic that made me realise it was a weekend." Teesside's Sharon Gayter has been wearing a face mask to combat traffic fumes as she reaches the 600-miles mark in the Flora 1000 Miles Challenge this evening. The Guisborough runner has been suffering from asthma, but has got the problem under control thanks to the effects of the mask. Sharon said: "The persistent cough has calmed down and now hopefully my asthma will allow me to start running more of the miles. "I want to build up to about ten miles running a day to prepare for the London Marathon at the end of the Challenge. "Then I'll taper down in the final week to a rest day on the Saturday." Sharon has lost a little fitness having walked most of the miles, but doesn't think it will take long to recover after the Challenge is finished. The New Marske Harrier is one of five remaining sleep-deprived athletes who are running or walking one mile an hour, every hour, for 1000 miles around the streets of London. 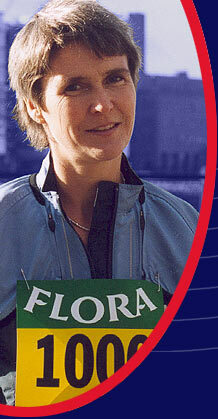 An attack of asthma is posing a threat to Sharon Gayter's bid to complete the Flora 1000 Miles Challenge. The Guisborough ultra runner, who was approaching 575 miles this afternoon, is awaiting new medication. She said: "I need the asthma to settle down and will start running next week. "I am awaiting stronger medication at moment and will be getting a face mask to help combat the pollution issue." She added: "I am finding more time to rest during the day and am doing more reading now which is very relaxing. "I am pleased to be over the 500 mile hurdle. The event does feel like its been going on for a long time, and although I enjoy the days the nights have become a bit of a chore knowing I will be woken up so much. "However I am still sleeping well and am not tired at all during the day. I have lost about 2kg in weight, partly due to not having time for a proper evening meal after the drugs test and medicals which took up two rest periods in the evening, while coughing has not helped." Sharon Gayter has a new helper as she makes inroads into the second half of the gruelling Flora 1,000 Miles Challenge. The Guisborough runner is being helped on the night shift by Nannette Cross, who has replaced Mike Harper from New Marske Harriers. However there was a chance that Nannette might not be allowed to assist. Sharon said: "I nearly had to call in one of my reserves as Nannette had come down with a cold last Wednesday. "Having a cold on this event is a major issue as the doctors are scared that there would be an epidemic as we are all living in close quarters. "No one is allowed on the bus with a cold and even if one of the competitors comes down with a cold they will be removed from the event to prevent it spreading." Fortunately Nannette is fine now, and Sharon is enjoying this stage of the event, especially following the mildest night so far. Teesside ultra-distance runner Sharon Gayter has reached the halfway point in her quest to complete the gruelling Flora 1,000 mile Challenge. Sharon and the other four competitors walked the 500th mile together and then enjoyed a celebratory glass of champagne. Sharon still has another three weeks to go but is being spurred on by all the messages of support arriving daily from Teesside. She received a card from everyone at Redcar Running Club with over 20 names signed on it and she also got a card from one of her neighbours. Bill Gayter, Room 112, Travel Inn, 159 Tower Bridge Road, London SE1 3LP. Nerves are jangling as the five remaining competitors reached the three-eighths stage of the Flora 1000 Miles Challenge in London today, writes ERIC PAYLOR. Guisborough's Sharon Gayter has received complaints from her rivals over the amount of space that her footspa takes up on the team bus. Now, she must use it either outside or in the tiny helpers' area at the front of the bus. Rory Coleman has asked for the bus engine to be turned off during the day as well as at night so he can get some extra sleep. This would mean the bus being without power, effectively disabling the kettle, microwave, toaster, laptop computers and television. At a team meeting it was decided that each time Rory wants a no-power situation he must have the agreement of all the other competitors.